Hand-cut, aged, and grilled perfectly to each client’s preference, we serve with al dente vegetables and house salad. Breast of chicken, sauteed with fresh garlic, shallots, mushrooms, lemon and brown sugar, finished with a white wine-cream sauce and served with basmati rice. Grilled Hawaiian tuna topped with Amaretto mushroom sauce, served with basmati rice. Idaho’s famous Snake River Trout sauteed in butter and flavored with our own blend of herbs and spices, served with basmati rice. Roma tomatoes, basil, garlic, shallots marinated in olive oil and balsamic vinegar served with toasted baguettes. Six large gulf shrimp sauteed with white wine, creamy butter, garlic, shallots and a hint of lemon, served on basmati rice. 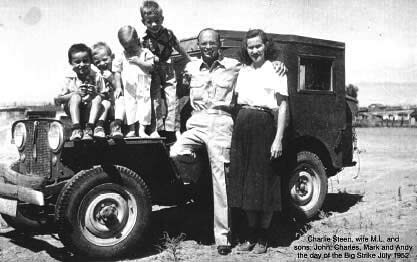 The Charlie Steen Story The Sunset Grill is in the former home of Uranium King Charlie Steen. In the early 1950s Moab was a small farming community. Arches and Canyonlands were places only a lucky few experienced. In 1952 Charles A. Steen, geologist and prospector, put Moab on the world map. 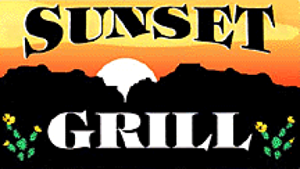 “On the last night of our week long stay in the Moab area we decided to try the Sunset Grill. We were a little tired after our afternoon at Arches and really wanted to eat at some place relaxing. This restaurant is built high on a cliff just as you are entering Moab and I thought it would be very crowded and touristy. It wasn’t at all. Very quiet and relaxing setting. Food and service was wonderful. Very interesting location, too. 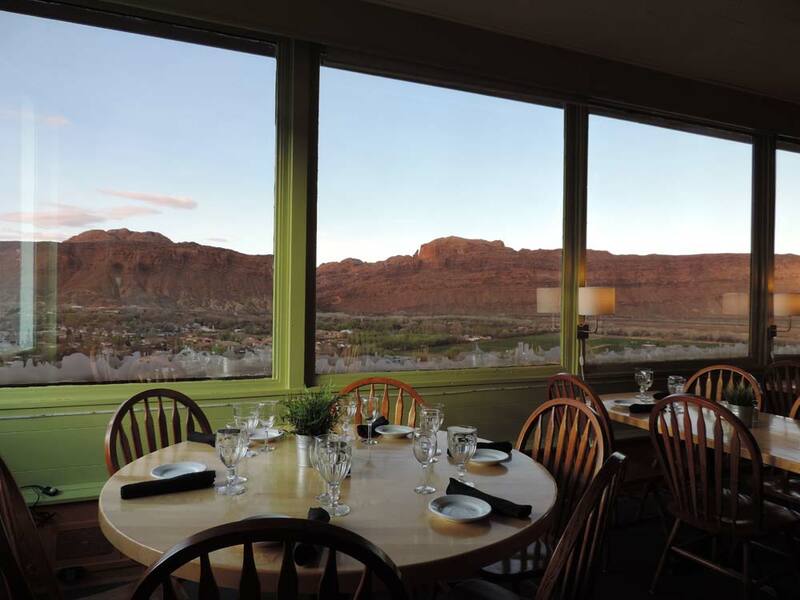 The restaurant used to be the home in the 1950s of a man who discovered Uranium in the Moab area. He became a millionaire and built this extravagant house that is now the Sunset Grill. ” Angie D.
“We came for a birthday dinner. Our waiter tended to our every need and made dinner such a wonderful experience. The food was delicious. It was truly a great experience and I would go back in a heart beat. Go. You will not be disappointed.” Margaret B. “Since it was a birthday celebration, I chose to eat at the Sunset Grill. My husband and I have eaten there many times over the years and have always enjoyed the food, the view, and the attention to our comfort and enjoyment. This time was even better as a our waiter, David, who had just moved from Nevada, was waitering in Moab, Utah. He took the time to talk to us and find out where we were from, what we did, and was very courteous and kind. I ordered the crab stuffed salmon and my husband got the pecan coated chicken breast. Delicious!! It’s a more expensive restaurant but worth eating at for such good food. 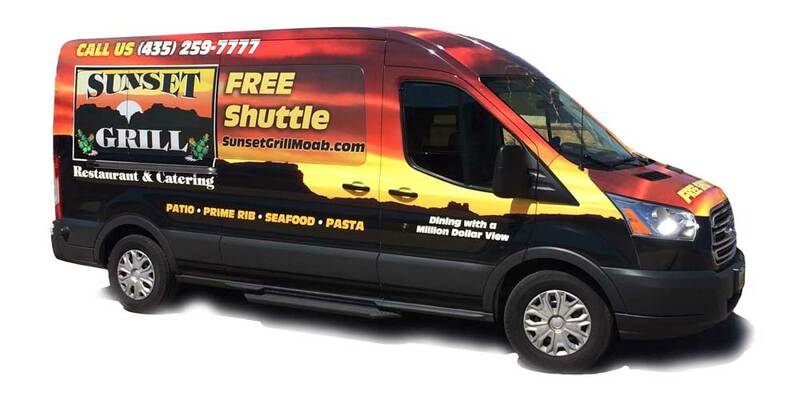 My hat off to the chef(s)!” Loralie H.
We offer a free shuttle service from any Moab motel, RV park or B&B and back again during normal restaurant hours. Just call us at 435-259-7777 for prompt pickup. The Sunset Grill offers full service catering. Whether it is a group of 20 or 500, we have 17 years of experience to fill your needs. We can offer services in any location. We provide onsite catering for local or remote locations. We can also accommodate up to 400 guests at our restaurant in Moab with inside and patio dining. Our experience includes providing 3 meals a day with 2 breaks a day for 350 people to groups as small as 20 for breakfast lunch and dinner. We were the main catering for”24 Hours of Moab” a 24 hour bike race, serving meals nonstop for 48 hours, provided 4 days of breakfast lunch and dinner for Sand Hallow Resort and much more. We have done on premise and remote location weddings and groups for companies such as US Forest service, Land Rover international, BMW, Toyota, Volkswagen, Jeep magazine, Daystar Jeep products, Coldwater Creek, The Leavitt Group and many others. We are happy to coordinate other aspects of your event. We can provide for portable toilets, water trucks, tables and chairs, additional tents and power supplies. We have access to temporary help for set-up and tear down or other labor needs. The Sunset Grill has hosted well over 100 weddings. 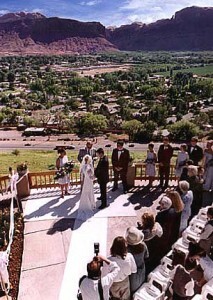 From small private ceremonies to large weddings and receptions, we have done it all. We offer a “no stress” experience for you and your guests. 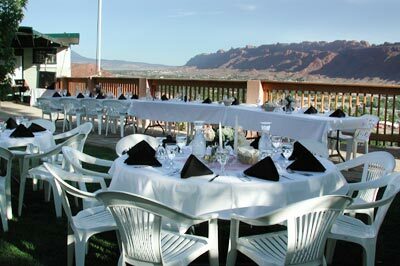 We are happy to provide a rehearsal dinner as well. Call or email for wedding pricing and complete menu options. Contact Laurie for more information.